The small locks are closed for 2 weeks in March, check News for status. The large locks are closed for 2-3 weeks in November, check News for status. 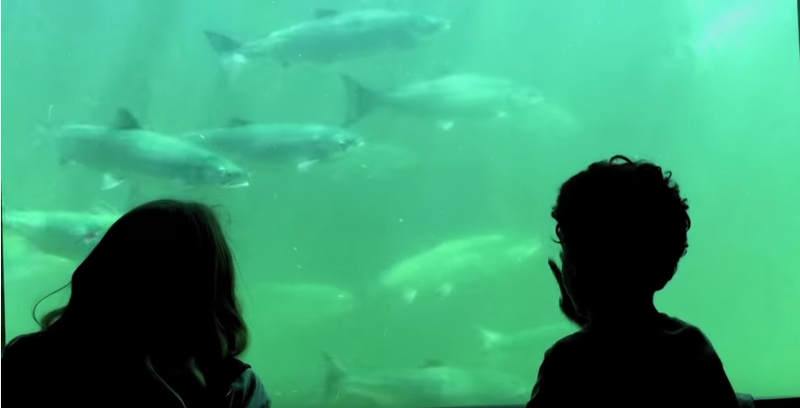 WHEN IS THE BEST TIME TO SEE SALMON? These maintenance schedules are chosen to accomodate both the salmon migration season and ship traffic. Sockeye (Red) - The largest run through the Locks, usually over 100,000 /year (but in recent decline). Peak viewing from mid-June to mid-July. Most sockeye head up the Cedar River Watershed (Seattle's water source) to spawn or are collected at the Cedar River Hatchery...see Facebook Events page to learn on-site from Naturalists at the Locks about the Cedar River Salmon Journey . Coho (Silver) - Average around 15,000 per year, peak viewing in September. Most Coho head to the Issaquah Creek Hatchery though some spawn in local rivers and streams. (Click here for tours or call the Visitor Center for current salmon information. Chinook (King) - Average around 10,000 per year, peak viewing in August. Most Chinook head to the Issaquah Creek Hatchery, though some return to Cedar River and other tributary streams to spawn. The fish ladder system is closed, drained of water, inspected and repaired as needed in mid-May and usually takes 2 weeks, but may take longer, check News for status. Steelhead - Once numbering in the thousands, are no longer seen at the Locks.